If you’re ready to step up to the next level in cycling and take up racing, participate in a major event or start a training program then you are going to need the right bike for a female rider. Up until about 10 years ago, female cyclists had to settle for men’s cycling gear, or unisex as it is often called, so that bikes were not quite the right size and the apparel definitely wasn’t. Thankfully during the last decade there has been a number of companies like Trek, Specialized, Cannondale and Giant who have spent plenty of time and money developing dedicated products for female cyclists at both the leisure end of the market, and the competitive arena. By working with professional female cyclists, some of the manufacturers have been able to get a first hand account of what women racers want. For example, Specialized sponsors the successful women’s pro team Boels Dolman and similarly Giant sponsors the women’s Rabo Liv Women’s Cycling team. Both have the opportunity to work with professional female cyclists to refine their product to make it function well, and also be aesthetically appealing. Giant has actually taken it one step further and created a sub-brand called Liv Giant for its entire women’s bike range which includes its high end racing bikes. Liv Giant has also opened a number of stand-alone women’s bike stores around the world including one in Sydney’s CBD. The result of all this development work is that these bike manufacturers don’t just shrink the bikes down and add a touch of pink, they actually design bikes and accessories that are functional and suited to women’s unique requirements. Specialized for example, says that because the average female rider’s weight is about 13.6 kilograms less than the average male rider’s and a women’s centre of gravity is lower, they focus on areas like suspension, tube-sets and lay-up stiffness to optimise performance of their women’s bikes. This makes the bikes climb and accelerate faster, while also making them more compliant. So rather than just making each frame a scaled down or up version of the others, each frame is developed to give it the best ride possible. It’s not just a way to market their products, these forward thinking companies are actually manufacturing bikes to suit women’s unique requirements. If you do decide to buy a unisex or men’s bike, then you may need to change the handlebars, cranks, saddle, stem and put spacers in the gear levers. In that case you might think about a women’s specific bike which already has all these things. And ultimately it all comes down to fit. The frame needs to be the right size for you. This obviously applies to both men and women when buying a bike. You can do a few things to tweak a bike to fit, but if it’s too big, or too small, it will never be fun to ride and you certainly won’t be competitive in the finishing straight. So when you’re shopping for a bike put most of your focus on the frame and the rest will follow. Buy the best frame quality you can afford and you can’t go wrong. Don’t become obsessed about what level of gearing it’s got. Set yourself a budget and then buy the best bike you can for your money. And definitely don’t take someone else’s hand-me-down, particularly if it’s not the right size for you. When women shop for just about anything they focus on the benefits of the product and this is definitely true when shopping for bikes and cycling gear. Women want to know what the bike can do for them, not the technical mumbo jumbo – how it will help them enjoy cycling and win that next race. So find yourself a bike shop where you feel comfortable and valued as a customer. One of the biggest challenges is to find a retailer that has many women’s bikes in stock. You need to shop around to find a bike shop that meets your particular requirements. You should also look out for demonstration days and bike expos. 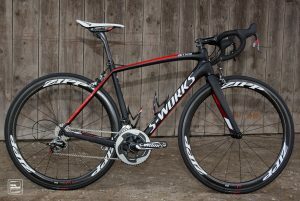 Specialized, Trek and Giant hold these on a regular basis and you can often ride a number of bikes. What steps have you taken to find the right bike for a female rider? Share in comments or via the Women Who Cycle Facebook page. Next Post:What’s it like to work for a pro cycling team? I already own an Avanti Road bike and a Giant hybrid. I am getting ready to replace the Giant and purchase a new hybrid all purpose bike for off road riding and perhaps touring, trails and general about town trips such as riding to work. So I am interested in the best place to start looking. I live in the country and will no doubt need to go to Melbourne or online. I am also interested in knowing what I need and what to ask for. I don’t want to feel intimidated by male bike assistants who might sell me an inappropriate bike for me. Your article has given me some knowledge to begin looking. Hi Patricia, I would choose an area in Melbourne where there are several bike shops you can visit in one trip. It sounds like you need either a hybrid bike or a flat bar road bike. The relevant Specialized bikes are called Ariel (hybrid) and Vita (flat bar road bike) and are available in a number of variants. The main difference between them in the suspension forks on the hybrid. I’m not too familiar with other brands but most leading bike manufacturers will also cover these categories. Good luck with your shopping. Thank you. Specialized Ariel and Vita. I will check them out online and next time I am in Melbourne.